About a month ago I posted my Sauerkraut recipe. Any one join me at the time? Here is what mine looks like now. The water is nice and clear. No floating scumminess. Nothing on the glass above the water line. This is a sign all is well. It has a good strong vinegary smell too. Fermented foods are sadly missing from many of our diets, and they are so good for us! Sauerkraut – the new old superfood. 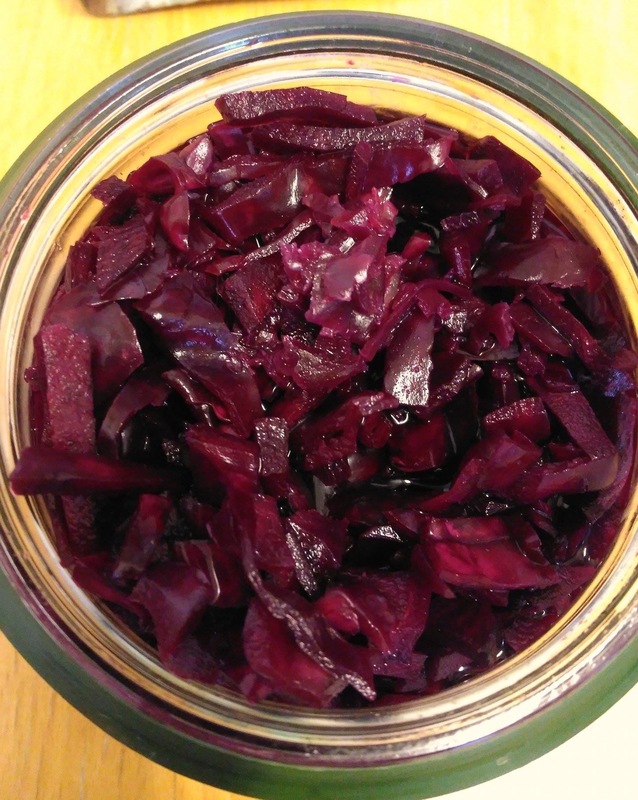 Fermented foods, how do I begin to sing their praises? I suppose I did already with my brief posts declaring the life force of my water kefir. I also have a wonderful kilner jar inhabiting kombucha scoby. These two and my sauerkraut all live and grow together in the corner of my kitchen named “ferment-ville”. I will rave a bit more about them after my “How to make sauerkraut”. There are many variations, lots of traditions but this is the one I made Thursday night! How to make sauerkraut! I may be bordering on a Kimchi, because of the ginger. First the Organic cabbage- organic because who wants to ferment chemical sprays! Second get a kilner jar, I used a 1 litre( 1+3/4 pints) jar, as I intended to do two cabbages. It is important to have sterilised the kilner with almost boiling water (that’s what I do) or steam sterilise. This is what your sauerkraut will be living in, it is better that it be really clean than risk bad bacteria getting a foothold. 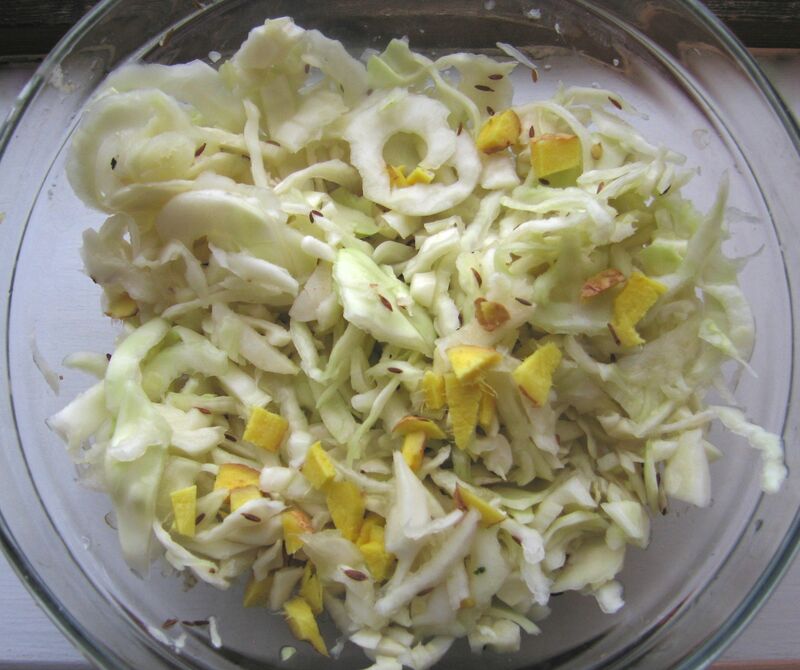 Two white cabbage- remove the outer leaves and discard. The leaves not the cabbage! Extra optional: A dessertspoon of sauerkraut you have made before or a good quality raw one from your health store. Rinse your hands, make extra sure there is no soap residue on them. Soap will kill the bacteria and inhibit the fermentation. 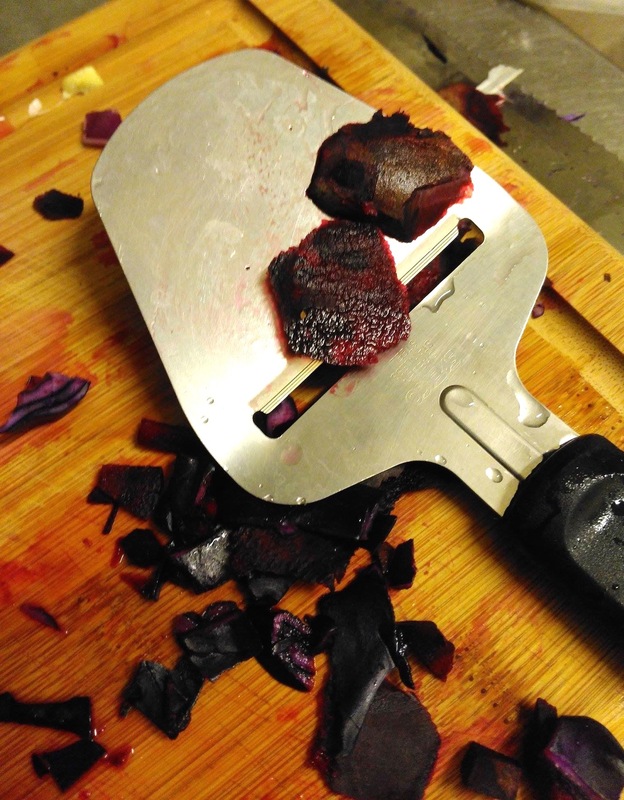 Cut the base off each of your cabbages, hold onto the hard stem as you can use this later. It can be a useful “cap” to hold your sauerkraut down with. I was given a spiralizer for my birthday by my lovely work mates. I am attempting to spiralizes everything at the moment. Including the cabbage for this! It spiralized for a bit. It then became stubborn and I stubbornly persisted for another bit. The wonderful contraption certainly sped things up.You can of course put it in a food processor or just chop it finely, think of the thickness you would expect in a slaw. Measure half the water, add two and a half dessertspoons of the salt and give it a stir. 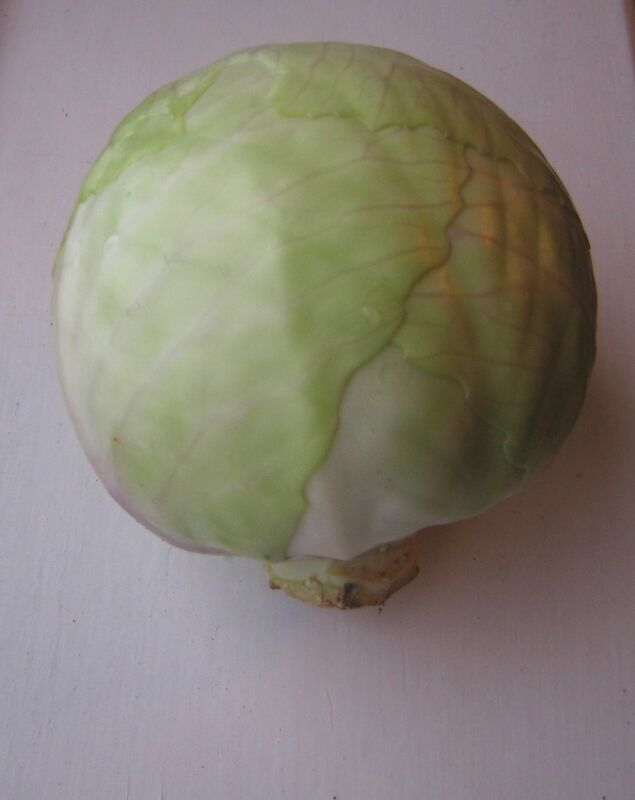 Pour the salt water (brine) over the cabbage. Mix things up and knead the cabbage for a couple of minutes. The salt and kneading helps draw water from the cabbage. Prepare your ginger. I rinse it and peel off bits that still seem dirty. Chop it finely and throw it in with the cabbage. Chop your cucumber. Add this to the rest. Toss the mixture and give it another knead. Next put a plate on top of it and weigh it down with something, I use a 1kg/ 2.2lb bag of flour. Leaving it sit gives the salt a chance to draw more water from the veg. During this time I usually clean up the bits of cabbage I have scattered to the four winds about the kitchen! Give it twenty minutes if you can. Cut your cloves of garlic in half. Grab your sterilised kilner jar. Uncover the almost sauerkraut. Grab handfuls of the mixture and press it down into the jar. if you find that there is not enough water to cover the cabbage add half a dessertspoon of salt to the left over water and add this to the kilner jar. Really get in there and try and compress the mixture as much as possible. Ideally it will nearly be to the top of your jar, maybe an inch/ couple of centimetres gap. Now arrange your garlic over the top, garlic is a powerful anti-bacterial and anti fungal, but won’t kill the friendly bacteria we want inhabiting the cabbage! Now grab your cabbage base, slice off any dirty bits, place in the jar and press every thing again. Everything should be covered in salty water. Make sure there are no bits of food sticking up out of the water or left on the dry sides of the jar and lid. These bits that are exposed the air will go mouldy and ruin your sauerkraut. Keep your sauerkraut out of direct light and away from extremes in temperature. Every day open your jar once. This will leave out gases and leaves in air so it ferments to grow good bacteria as opposed to alcohol. Prevents the jar exploding too. After maybe a week you should start to notice the smell changing. It will take on more vinegary notes, a sign all is going well. You could could eat it at this point, it would be like fermented slaw. If you would like a softer texture and more sour flavour I’d say a minimum of two months. 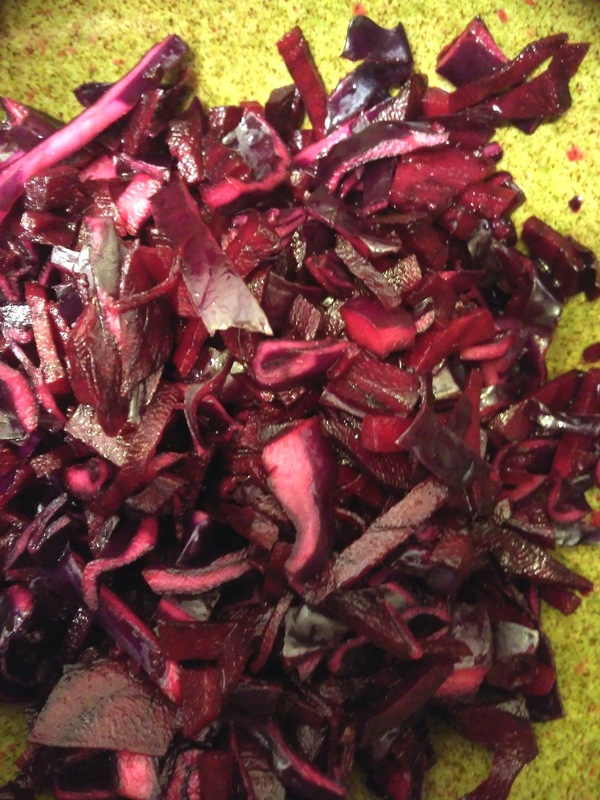 The white cabbage takes longer to soften, if you shred so it is EXTREMELY fine it will soften faster. Once opened I keep mine in the fridge. If you have lots of space in the jar and everything is not covered in water you can grab a whole bulb of garlic and sit this onto. When you close the jar everything should be compressed. If a bit of the garlic is sticking out the top that is okay. Second option: if like me you decided one and a half cabbages would probably fill the jar and gave the rest to your partner so he could make amazingly yummy vegan coleslaw. You may have even more of a gap. So what I did was sterilise a really small jar, roughly 7cms / 3 inc. high. After I put my garlic and cabbage on top of the mixture, I put in the jar and pressed everything again. I then closed the jar. I have done this before and it worked out fine. Things to never do. Never use a plastic container A:It can not be sterilised and B: the sauerkraut produces lactic and acetic acids (hence lacti- bacteria being in it). Acids will eat into plastic so not a good combination. Never change jars after you have made it. It upsets the sauerkraut, it does not like change. I speak from experience. I had not left enough of a gap in my jar the first time I made sauerkraut and it all started to try and escape. I transferred it and it started to grow a white mouldy bloom within two days. What makes Sauerkraut Super. 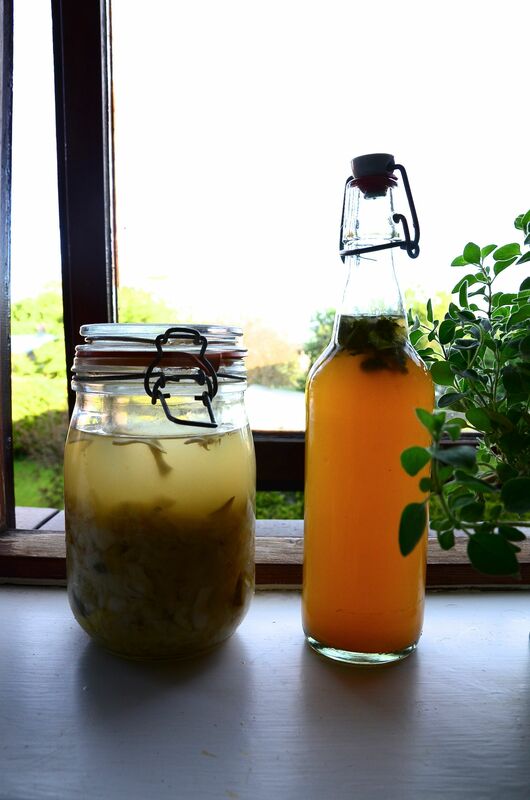 A bit about fermented foods. 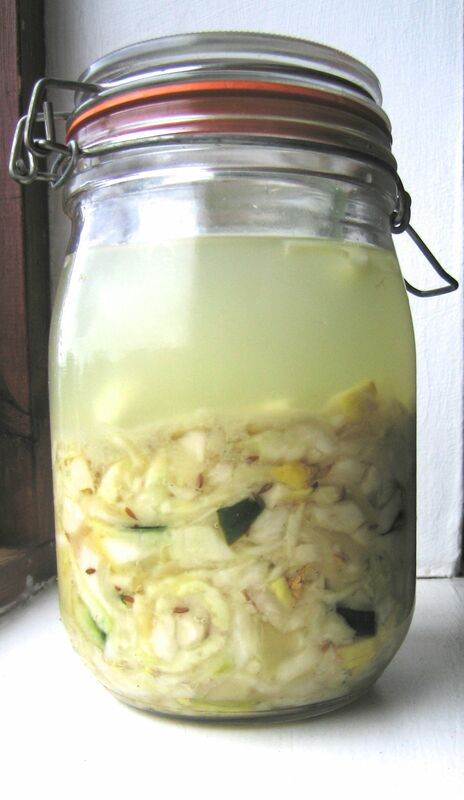 Most people in the western world do not regularly consume fermented foods, if at all. Western diets are also high in processed foods and people do not eat enough fresh foods. Vegans and vegetarians generally do better but most people think store bought yogurt is the only fermented food about. Store bought yogurt is nothing in comparison with traditional yogurts or milk kefir (my Nana called it her yogurt plant). Being vegan clearly I am going be staying clear of the poor cow’s milk. But there are plenty other healthy fermented food that one can make or buy in good health stores.